Once again browsing Brownells “New Products” I happened across one of the most interesting and expensive AR-15 UPPER RECEIVERS I have ever seen. 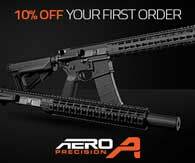 The ARES 15 MCR Magazine Belt Fed AR15 Upper Receiver. The ARES 15 MCR Magazine Belt Fed AR15 Upper Receiver is an AR15 upper capable of using standard AR-15 magazines or being belt fed. Did I mention “Full Auto” belt fed? 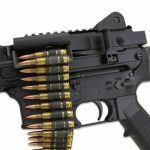 ARES 15 MCR Magazine Belt Fed AR15 Upper Receiver allows you to convert your AR-15 or M16 from a standard, magazine fed rifle, into a multi-purpose belt-fed, that can also feed from a magazine. Simply attach the upper as you would any other, link up your ammunition and go to the range. This unique upper receiver includes a Picatinny rail mounted to the top cover, as well as a Picatinny handguard. 16.25” quick change barrel features a chrome lined bore & chamber. 1-7 twist stabilizes standard, military ammunition, and ½-28 muzzle accepts standard muzzle devices. Receiver is machined from 7075-T6 billet & features a Type III matte black anodized finish. 6-lug rotating bolt is more robust than a standard AR-15 bolt, and is designed for sustained fire roles. Feed tray is black nitride steel for improved wear performance. Bolt carrier is full-auto. Upper utilizes M249 SAW links. Upper weighs 7.45 lbs & has an OAL of 32.25”.